I am going to let you in on a little parenting secret today… my dear sweet Little M has a really strong personality. I’m sure if you have been following me for a while, you are not that surprised. For the most part some firm consequences and a brief “moment alone” will bring her back to her normal, happy, singing self. While I am not perfect, I do try my very best to use only positive parenting techniques. In the past few weeks, we have had a lot of BIG changes in our house and Little M is not handling it well. I decided to bring out the big guns! Again…I will not take credit for this brilliant strategies. Just like with Conflict Resolution… I learned it years ago and have no idea where! Little M loves to make books, so I let her prep this one. She cut pieces and stapled them together. I filled in the words and then she drew the pictures. Depending on the age (and interest level) of your kid, they can be really involved in making the book or not involved at all. 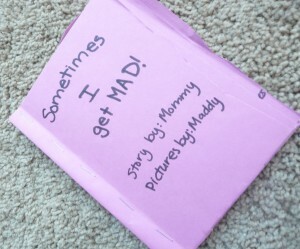 Title: Sometimes I Get Mad! page1. My name is Madison. Some people call me Maddy. I am 4.
page2. I like to be silly. I like to laugh. Sometimes I am very happy. page 3. When I am happy I smile. When I am happy I jump. page 4. Sometimes I get mad. When I am mad I want to yell. page 5. But I am 4. 4 is big. So I behave like a big girl, even when I’m mad. page 6. When I am mad, I take myself to a quiet place. page 7. I take deep breaths until I am calm. When I am calm I can use my big girl words. page 8. When I use my big girl words, it is easier to solve my problem. page 9. When I solve my problem I am no longer mad. I am happy. I love being happy. page 10. I am proud of myself for being able to control my feelings. page 11. I am Maddy and I am a big girl! 1. Pick a specific behavior. 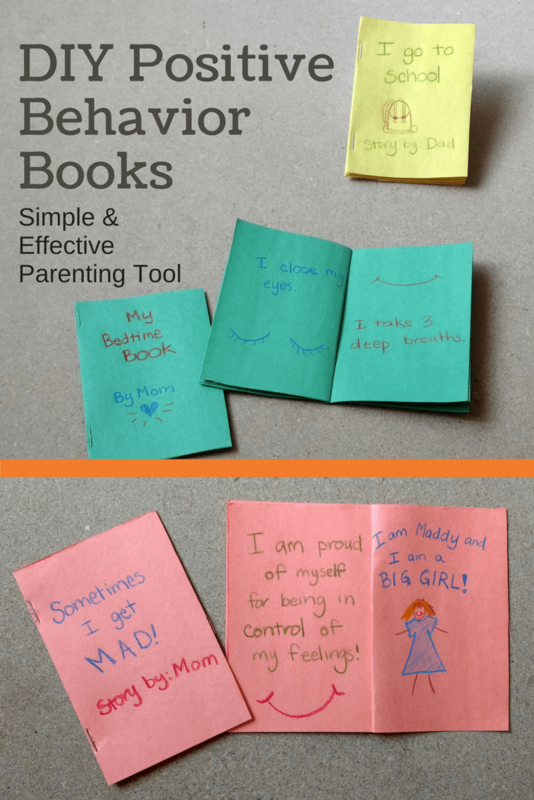 I have used this type of book so many times and it works for just about any behavior. (Possible behaviors; walking in the store, crying at drop off, staying in bed, using nice words, and picking up toys). 2. Keep it really simple. Make sure the book is to the point and only has a sentence or two per page. The book I made for Little M was a bit too long. I think they are best kept between 7- 10 pages. 3. Positive is the keyword! 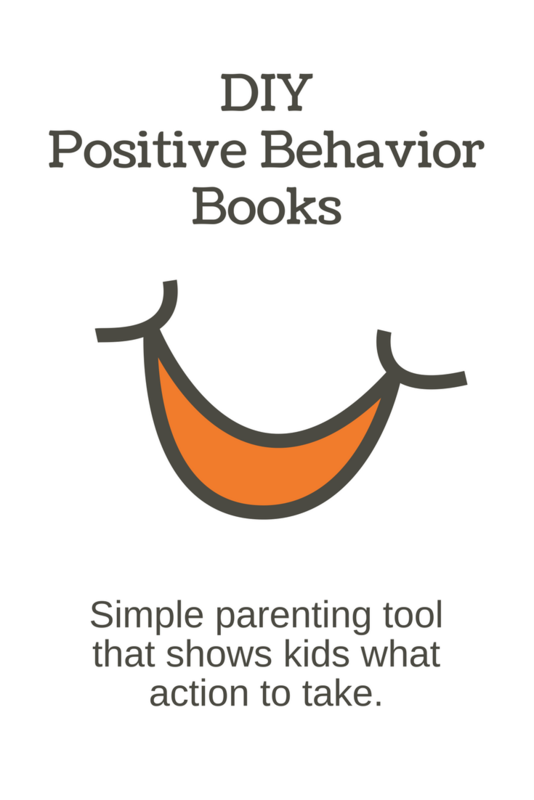 The book should describe exactly how you want your kid to behave in a positive way. Everything should point towards the new behavior (and ignore the old one). Make sure to highlight how your little one will feel when they have accomplished the new behavior. 4. Read it. Make sure to read your Positive Parenting Behavior Book over and over and over again. If you know that there is a certain time or thing that will trigger the behavior read the book just before it’s about to happen. Are there any behaviors you are dying to reshape? I would love to hear if this book works for you as well as its worked for us! If you need help coming up with the words contact me…I would love to help! These parenting books (and self-improvement books) have helped me become a more grounded and happier person/parent. These are affiliate links. This positive parenting post originally appeared on September 9, 2011. This is a great idea. I like the sound of a positive behavior book. I love anything with a positive spin! Do you have ideas for changing behavior in teen-agers? I’m not yet to the teen years Pam… you can join our Confident Parenting Facebook Group there are parents of all ages there! YEAH! The more we can empower our kids to solve their own problems the more prepared they will be as adults….sounds like The Explosive Child has the same idea! Do you have a picture of what the pictures look like? My daughter just turned 4 and I would LOVE to do this with some of the challenging behaviors we have. Just curious what the pics look like. Thanks! YIKES! There is a reason I didn’t picture them 😉 I am no artist…that is for sure. In the interest of passing on great techniques though, I will add some pics. Watch for them in the next few days. Also you could use actual pictures, have your daughter do a photo shoot and then print them out! good luck, i hope it helps. i try to do the same kind of thing with my 2 yr, old grandaughter, helps to avoid surprise meltdowns. I actually did this right away because we have been having issues with my son, suddenly. HE LIT UP LIKE A LIGHT when I gave it to him!!! Hoping we can reference it next time he throws an “angry” tantrum. I will post photos to my blog shortly: http://www.OurNewNormals.com and link back to your site. I’m going to do this with my kindergartener. I’m going to have a brainstorming session with him and we will think of ways together where he can make better choices– then I’ll add those ideas to the book. I think I’ll keep it short enough where he illustrates some of it also. I also like the idea to use photos for the book also. I needed a post like this. Thank you so much!!!!!!! I am so glad it came at such a good time for you! I would love to hear how it works once you get the book made. This idea is fabulous! Not only are you creating a book, but you are also modeling positive behavior (choices for behavior)!!! I am going to use this with one of my students for talking out / impulse control. It’s good to have reminders on expected behavior! 🙂 This will come in handy with my own little kiddos as well!!!! THANK YOU!!! Love this. Thanks!! I have a strong-willed girl who will relate to this!! Thank you Shawn! I would love to hear how it works for you if you give it a try. What a cute and positive way to encourage good behavior. I’m gonna do this with my 4½ yr old son. He has a lot of meltdowns during the day. I’m turning grey haired! I just made this book, and our five year old daughter loves it! I adapted it to “Sometimes I feel like lying” We mostly discussed how good it feels to be honest and how happy it makes us and our family. She said every time she feels like lying, she is going to read it! I love it! Love it! Love it!! Thank you so much for the great idea!!! I love your site….thank you for taking the time out of your day to put this together. I find I am often lost for words and ideas when it comes to being a positive influence for both our children. So thank you your site is wonderful. Thank you so much Amy! I’m glad that you have found useful information. What a creative idea! A must pin for later! Will definitely be using this when my son gets a little older. Love this idea! I just finished a post on making books with kids – so to come across this just now on HDYDI was a fun coincidence. This reminds me of the self-talk behavior plans I have used in schools, but I never thought to make it into a book the child could illustrate/help with. Thank you! Interesting. I would never have thought about doing this. My daughters are four. Thanks for linking up to the HDYDI link up! I absolutely love this! I was just discussing with my 4 (almost 5) year old ways to control her anger. She’s been throwing tantrums and seems to forget all the ways we talk about handling our feelings. I think this sort of visual will be so helpful to her (and myself as well while trying to work through them with her). After reading your post, I just wrote a poem for my6 yr old son called “If you give Ryan a direction”. It has two parts, one detailing what happens if he doesn’t do the direction and the other if he does the direction. Read it to him and then discussed it. We will see. Thanks for the inspiration! How fun! I would love to hear how it works. I confess, I found you on Pinterest and am not familiar with your family. 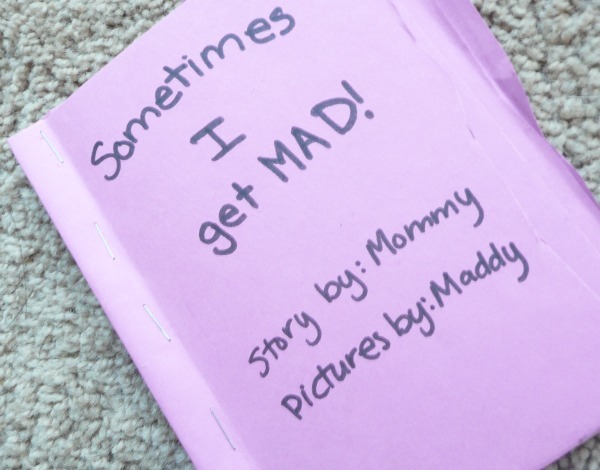 When I saw the picture of the book and saw “Written by Mommy” “pictures by Maddy” I thought Maddy was a cute play on Mommy, as your Mad alter-ego. 🙂 Like this idea. Might try it with my own kiddo. Thanks!